The proposed new Library Policy of Kendriya Vidyalayas (KV) has made it compulsory to KV Libraries to conduct classes on basic information literacy concepts. Students will learn the basic IL concepts (on Library, Internet, Media, etc) through a number of pre-planned technical sessions/activities/programmes (see the IL Curriculum Chart) which will make them expert users of information available in any format and become lifelong learners. 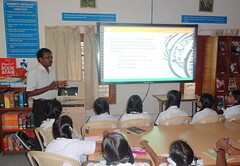 The Library at KV Pattom has started the IL sessions on 16 October 2012. Students from Class VI-X are invited to join the InfoLit India Pilot Project. Membership intake: 50 students. Membership forms are available in the Library. The skill development sessions under the Project are planned to be conducted after the normal school timings. So, students who want to join the Project are advised to take permission from their parents to stay back after the school hours (12.40 pm to 1.40 pm) on pre-informed days. There will be a parallel evaluation of the academic performance of the students during the project period to assess the effectiveness of the Project. InfoLit India, the school information literacy project launched by the Library Media Centre of Kendriya Vidyalaya was inaugurated by the famous Malayalam poet Kureepuzha Sreekumar at a function in the school. He also released the project logo. The project aims at developing the essential 21st century literacy skills (Information, Media and Library) in the students of Kendriya Vidyalaya Pattom through instruction, training and research. It is conceived on a basic information literacy curriculum which was developed according to the standard skill sets required in an Indian education environment. K. R. Manoj, documentary director, P. K. Sudhi, novelist, C.P. Kumaran, Principal and S.L.Faisal, project coordinator were also present.